“ The European Prize for Urban Public Space is a biennial competition that aims to recognise and encourage the creation, recovery and improvement of public space in the understanding that the state of public space is a clear indicator of the civic and collective health of our cities. Eligible to apply are works that have created, recovered or improved public space within the geographic limits of the Council of Europe in the years 2012 and 2013. 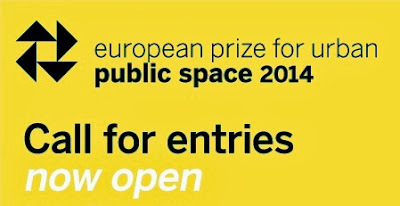 These entries must be presented by the authors or the institutions that have sponsored the public space project. The prize-winning works, the finalists and a selection made by the Jury will be published in the European Archive of Urban Public Space, which brings together and makes available to the public the best projects that have been presented in the competition since its inception and will make part of travelling exhibition of the 2014 Prize. For more instructions on how to register, competition guidelines and rules go to their website.